Greetings! We here at the Squid Research Lab have some fantastic news. According to the position of the sun and the level of the tides (and also the calendars on our desks), it looks like it’s time for the Splatoon 2 game to launch for the Nintendo Switch system. What an exciting day! Even more exciting, the new SplatNet 2 mobile service, which is a part of the Nintendo Switch Online app* for mobile devices, is also launching. SplatNet 2 lets you track things like stage schedules, gear and stats. This is great since many Squid Research Lab employees are taking their summer vacations soon and want to be able to check in on Splatoon 2 info at all times. Recently, we aired a special Nintendo Direct presentation that was as fresh as it was informative. Tons of details about the modes, weapons and styles of Splatoon 2 were covered, so please watch it here to get a refresher before diving into the game. By watching the video, you’ll also be introduced to two new characters: Pearl and Marina. Pearl and Marina are the new hosts of Inkopolis News and the recurring Splatfest competitions. A special Splatfest for Splatoon 2 just occurred on July 15 and pit ice cream against cake as the better dessert. Team Ice Cream emerged victorious, which caused quite the stir at the Squid Research Lab, as many of us prefer pie. The first Splatfest competition after launch will occur the first weekend in August and asks your condiment of choice: mayonnaise or ketchup? (Specific timing will be announced in the future.) New Splatfest competitions, as well as free updates to the game like new stages, weapons and gear, will be coming to Splatoon 2 on a regular basis. Whether you are inking your way through the many online** and local*** multiplayer modes in the game or the fun single-player adventure, the power of Nintendo Switch lets you play Splatoon 2 anywhere! So please feel free to engage in battles at the beach, on the docks or in a submarine! (Or, you know, anywhere non-aquatic-related.) 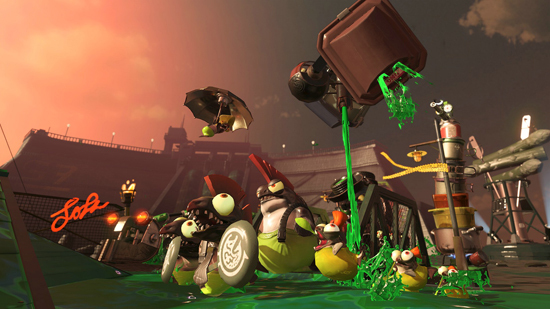 The new Salmon Run mode (which is a favorite among our researchers) can be played at any time locally and is also available to play online at designated times, just like Splatfest! In fact, rumor has it that the Salmonids plan to attack during the first three days after launch (July 21-23). If you want to take a part-time job with Grizzco Industries to help fend off these menacing migrators, this would be a great time to do it! In addition to the game and SplatNet 2, three new Splatoon series amiibo figures are also launching today. Sadly, these new figures aren’t based on anyone that works here in the Lab, but they are new models for the Inkling Girl, Inkling Boy and Inkling Squid … and that’s pretty fresh. By tapping any Splatoon series amiibo figure you can save control settings, gear and weapon loadouts, as well as any clever nicknames. 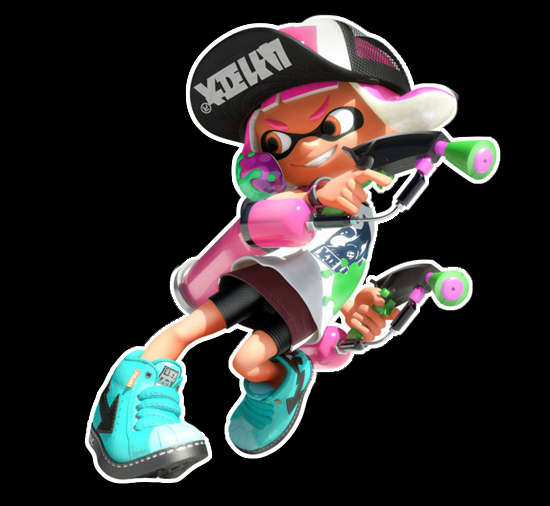 You can have a different set saved to each amiibo for quick access – perhaps one might be your Splat Dualies set for use in Turf War and another is your Goo Tuber set for use in Ranked Battle. It’s up to you! Two years have passed since the original Splatoon came out (what a proud day!) and two years have also passed in the game. This means that many of those styles and weapons you remember from the first game have evolved into things even more stylish and current. 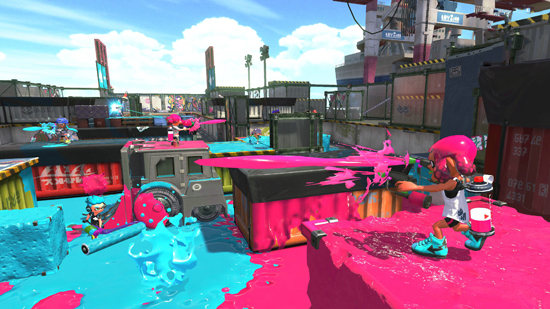 We can’t wait to see what outfits and hairstyles your Inkling will be sporting in this new game. *Nintendo Account, compatible smart device and persistent internet connection required. Data charges may apply. ***Additional games and systems are required for multiplayer mode and are sold separately.